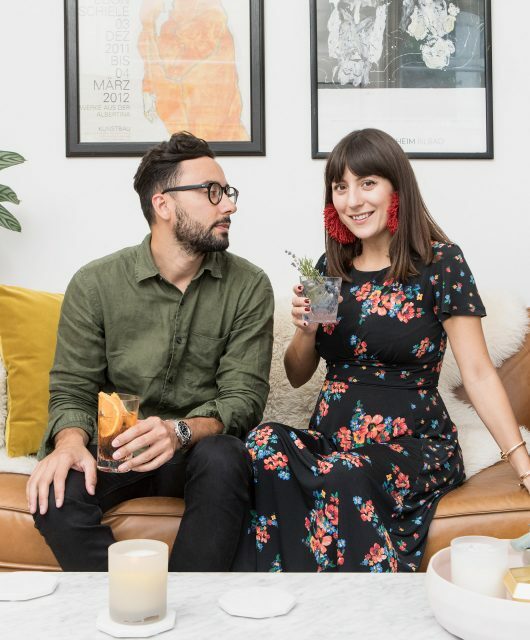 Putting a nursery together is one of the nicest tasks of pregnancy preparation, and so closely tied to the nesting instinct. But while I loved decorating my baby’s room, I also found it made me feel anxious with superstitions often playing on my mind. 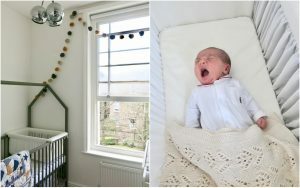 That constant fear of what ‘could’ happen was a big feature of my nine month experience, but giving into the unknown and deciding to try and put those worries aside was one of the biggest turning points for me—and decorating the nursery was definitely a big part of that. Here’s a look at the furniture and details that make up the baby’s mini room and some of the thoughts that went into my nursery choices. Colour is always the starting point for my decor choices and for this room, I wanted to keep things simple, serene but also add some warmth to the palette. As we had already decided to name our baby Grey, it seemed a natural choice to opt for tones of the achromatic colour for his room. From soft dove to charcoal, these shades formed the basis of the furniture choices adding a clean, modern feeling to the room. Grey also works well with white walls which we decided to keep to bring a sense of space to the bijoux proportion of the room. To add the warmth, I added a deep ochre and several shades of yellow to the artwork and accessories—otherwise it could have felt a touch austere. For the furniture, what I didn’t want was to buy a bassinet or cot which would only last six months, or even a year before it needed to be updated. 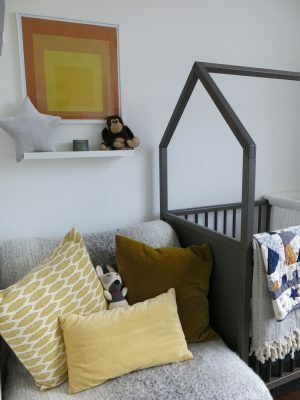 It’s really easy to believe that there is no way around children outgrowing furniture, but from a sustainability perspective, I wanted a cot that would stand the test of time. A great brand for channelling this ethos is Stokke – a Norwegian children’s design company with a sustainable philosophy. After a lot of research, I chose the iconic Home Concept Bed, Cradle and Dresser all in Hazy Grey for the nursery. The bed, with its distinctive roof is suitable for newborns to children around the age 5. With an adjustable mattress height and removable side rails, it grows with your little one, transforming from a roomy crib to a playhouse. I decided to add the Home Cradle to the frame, saving space rather than adding another bassinet and the Home Dresser to create a matching storage option with a changing tray affixed to the top. When you have such little square footage, you need to look for multi-tasking furniture and this collection is cleverly designed to save space while never compromising style. When we need a high chair, I’ll definitely be purchasing the classic Tripp Trapp chair which Stokke is probably most famous for, again because it grows with your baby (and can actually support and adult up to 140kg!) 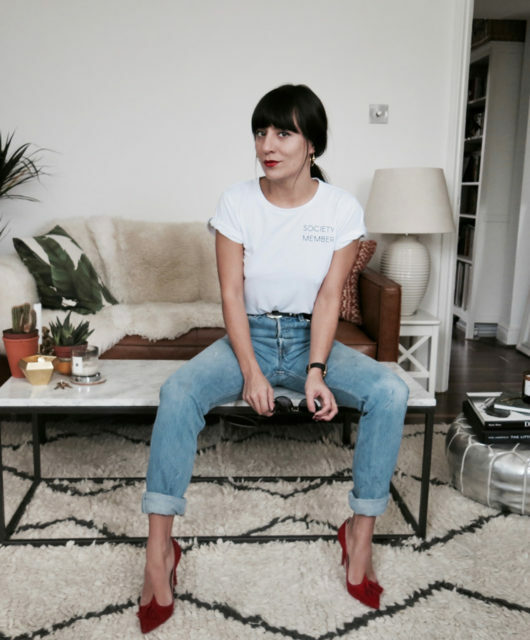 While these pieces are obviously not the cheapest, they are timeless and won’t need to be upgraded, so in the long run are definitely worth the investment. When it comes to dealing with tiny spaces, finding a fold down bed can also be a real challenge. 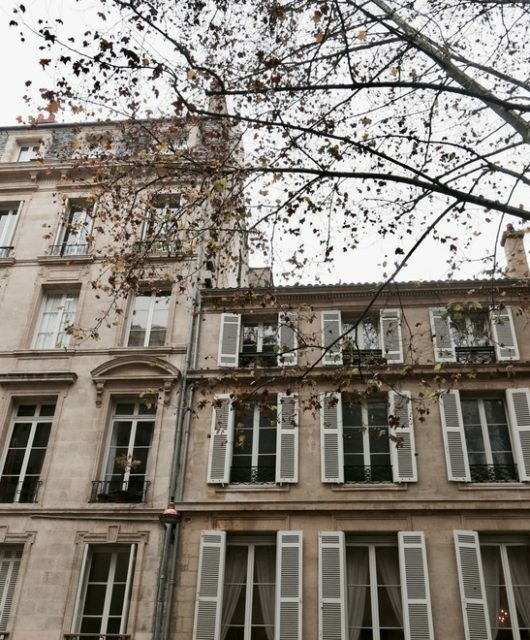 I went around what felt like every interiors store in town with a measuring tape desperate to find a single sofa/chair bed to ensure that in an emergency we would still be able to use our second bedroom for a guest (or as a sanctuary from the long nights of newborn cries!). Even though I was prepared to invest in a higher end option, the best design by far was the Lycksele chair bed from Ikea. We added a mattress topper for comfort and covered with a graduated grey throw to best suit the room. I then mixed textures and shades of yellow with a selection of cushions to echo the artwork. The chair-bed fit next to the bed with literally 3cm to play with (its 80cm in width), but it opens perfectly and my mum—who slept on it for a week—has assured me that it’s very comfortable. If you look anywhere on Pinterest or the kid’s departments of decor shops, you’ll find a glut of ‘baby art’ — graphic messages about ‘Boys Ruling’ or girls being princesses. While I love children’s illustrations, I’ve always found the more simplistic kiddie art strange, simply because there is so much real art, created with bold colours and shapes, which works so well for children. 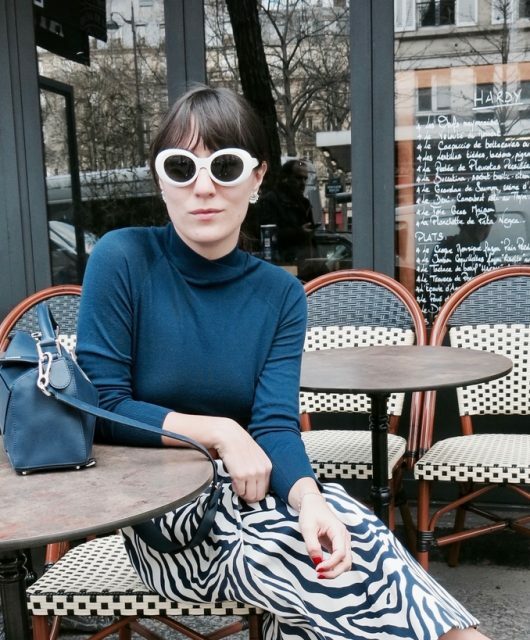 I grew up with Matisse’s The Snail and abstract art in my room, so I wanted to recreate that in my nursery. 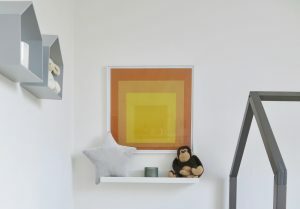 My first choice was Josef Albers, Homage to the Square, Glow, 1966 because the shades of yellow ending in ochre were so perfect for the room’s palette. I then also fell for Green & Yellow by the Australian Inaluxe duo, which has a similar mid-century vibe and also picks up the yellow hue. Both pieces were from King & McGaw, the latter I got framed too, while the former I put into a Habitat Aluminus frame. 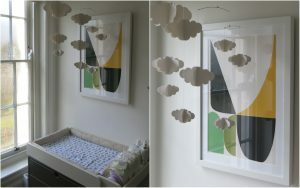 To complete the look, I added a soft cloud mobile from The Little White Company to give Grey something to look at while I changed him and to keep the atmosphere dream-like. While I haven’t entirely finished—I want to put together a picture wall of family/ pregnancy/ baby images which I still need to pull together and frame—most of the final dressing has been done and that’s what has really brought the room to life. As there is no space for a wardrobe, I decided to opt for a peg shelf on which I’ve currently hung two baskets. Inside one of the baskets is a set of hangers, meaning that if anyone does stay over they can hang four or five pieces of clothing from the pegs, an idea I took from Shoreditch House which uses the same device. 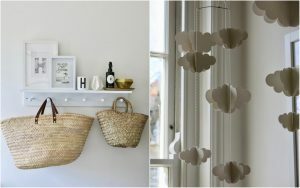 Left: Peg shelf from John Lewis, Baskets from French markets, Right: Closeup of Little White Company mobile. 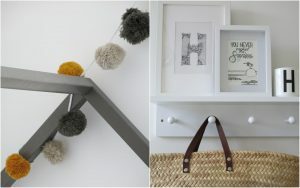 I also decided to add some playfulness with pom pom bunting, which I found in the perfect palette from Maisons du Monde. I tied two of the garlands together, hung across the window frame and connected to the Home Bed to bring a festive feel to the rest of the room. 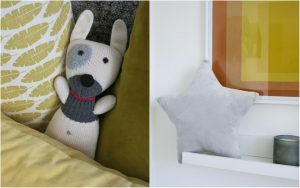 Elsewhere soft toys and cushions add comfort as well as texture to the room. There’s no doubt that it is now my favourite room in the house, and I cant wait to see how baby Grey grows into his space. Even if we move, I know that the Home collection will come with us and I hope that he will make endless memories in his playhouse bed in the years to come. This post was created with Stokke as part of a collaboration.